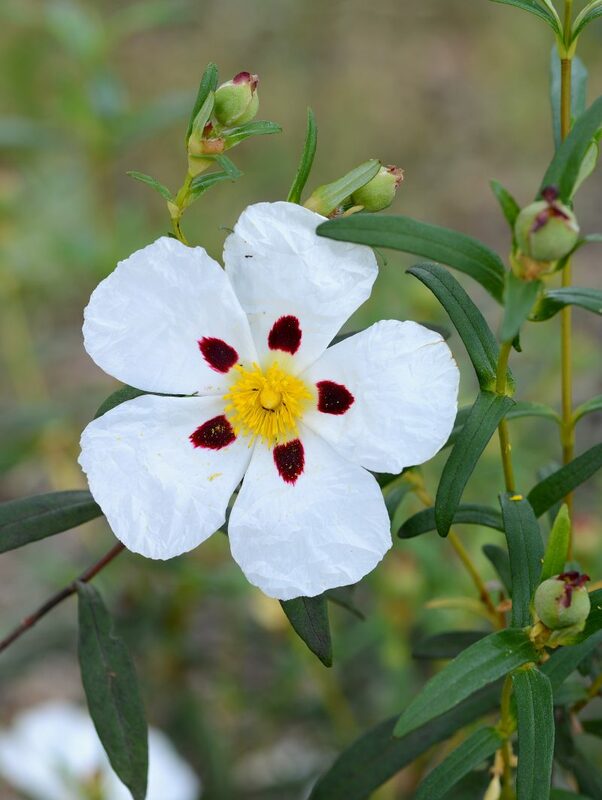 Labdanum is an aromatic oleo-resin-like that comes from the cistus bush, commonly known as rock rose (Cistus ladanifer L.). The vernacular names of the cistus bush, gum rockrose, ladanum, labdanum, and common gum cistus refer to this sticky resin that it exudes. It is the glandular hairs on the leaves that yield the oleo-resin. Labdanum is one of the oldest known aromatic substances and highly revered. It was harvested in ancient times by collecting the wool of the sheep that grazed among and rubbed against the shrubs. Egyptian pharaohs rubbed labdanum in their beards. It has recently made a come-back as a natural beard emollient and fragrance, although we suspect that the pharaohs used it for more than grooming. The Egyptian god Osiris is often shown with two wands, one a crook, the other a flail that is likely a labdanum rake. In ancient Sumeria, warriors rubbed it all over their skin. Already then, it was known to be very good for the skin and wound-healing. 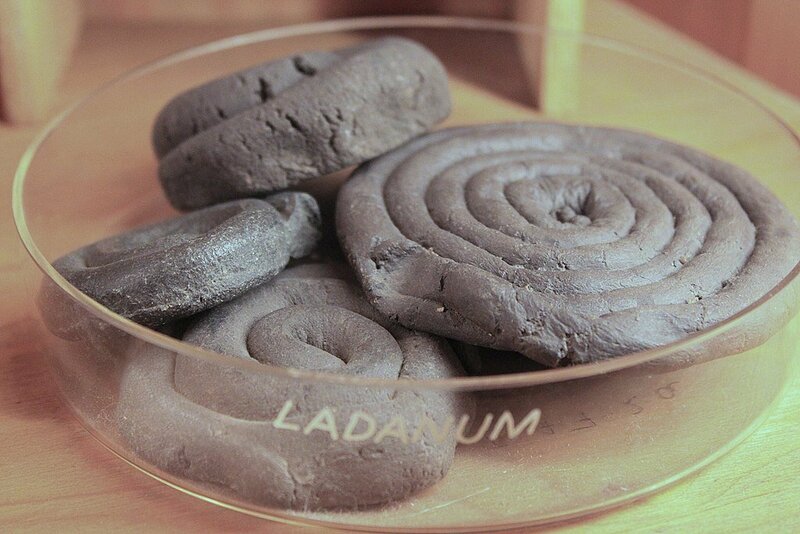 Due to its energetics, labdanum helps repair emotional wounds and energetic leaks. It brings us back into ourselves. It has the ability to bring to the surface traumatic cellular memories. We use it extensively when working with past traumas from this lifetime or transgenerational traumas that people are carrying from their lineages. Often the only way to cope with a trauma as it is happening is to try to suppress it and dissociate. For example, young children that have been sexually abused are not capable of processing the situation at the time of the event and will dissociate and unconsciously, instinctively attempt to suppress memories. This is an important survival mechanism, but it means that the energy of the memory hasn’t been processed and released. Even though memories may be suppressed, the trauma is stored as cellular memory in the body. As the child gets older, often later in life, there may come a moment where these memories are ready to be processed, when the vessel, i.e. the self, is strong enough. In such situations, when the client is ready, labdanum can help traumatic memories resurface so they can be processed. We have also seen it work in the same way for help processing ancestral trauma and un-earthing genealogical memories, re-growing and reconnecting to our roots. For people who are working on processing historical trauma and keep going over it repeatedly, labdanum can help bring some order to the process. It has an affinity with the third eye. I have used it extensively for my own transgenerational work and with others. It helps us bring up cellular information that seems to be lost forever. Sometimes the traumas have been stored deeply in the body, hidden and overgrown. Labdanum can help open the channels for these sometimes-ancient cellular memories to surface. Cistus is determined and will dig until it gets to the truth. At the same time, it sharpens our consciousness and cognitive abilities and enables us to interpret the cellular memories and integrate them healthily. One of its gifts is that it reveals that which is hidden. In the same way, it digs into the deepest parts of ourselves and focuses us on both what is essential and what is hidden (the Shadow). This may be one of the reasons cistus has a great affinity with the sacred, sesquiterpene-rich oils, such as spikenard, sandalwood, myrrh, etc. It has a very powerful healing energy. Physically it is one of our best hemostatics. With deep inner work, it has the ability to seal openings where energy is being leaked out. It is at ease helping expose family secrets and unresolved wounds that are hiding in the DNA. That is why it is such a good ally for historical trauma work. We recommend that you smell the oil, either from the bottle or on a scent stick. Allow the plant medicine to lead the way. You have to do nothing, but just be open and receptive. Allow the energy of the plant held in its aromatic molecules to come into you. When you are working with unlocking shadow aspects or hidden traumatic memories, let the plant nudge the cells that hold these memories. Imagine tiny bubbles like champagne bubbles being released from the cells and rising to the surface. All you have to do is be open, notice, listen and feel what comes up. Do not try to ‘understand’ at this stage, just observe and make note. Once the work with the plant ally is finished, you can look in more detail at what came up and how to interpret it. 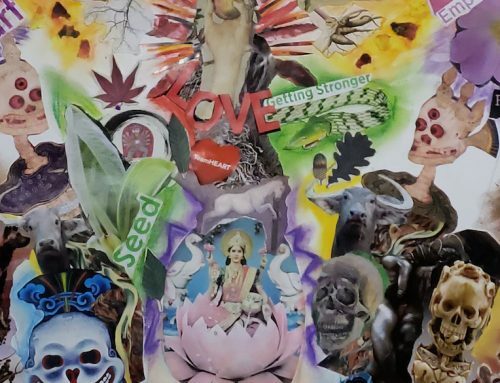 Labdanum is a very powerful plant medicine and it is not advisable to send clients off to do this work alone, because they may not be prepared for what comes up from the shadows of their unconscious. 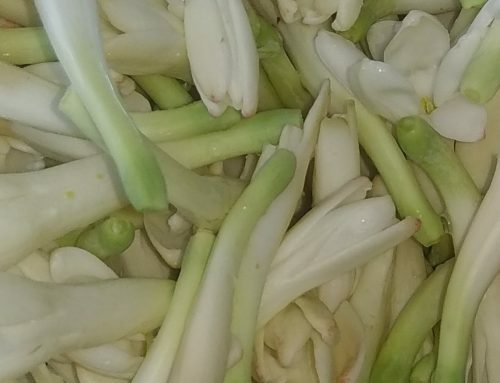 The ground needs to be prepared and it is best that someone with prior experience of this type of work with labdanum guides and accompanies the process. Some of you have taken our classes and have been initiated into using labdanum with proper care. There are many cistus essential oils out there, which are produced from steam distillation of the leaves. 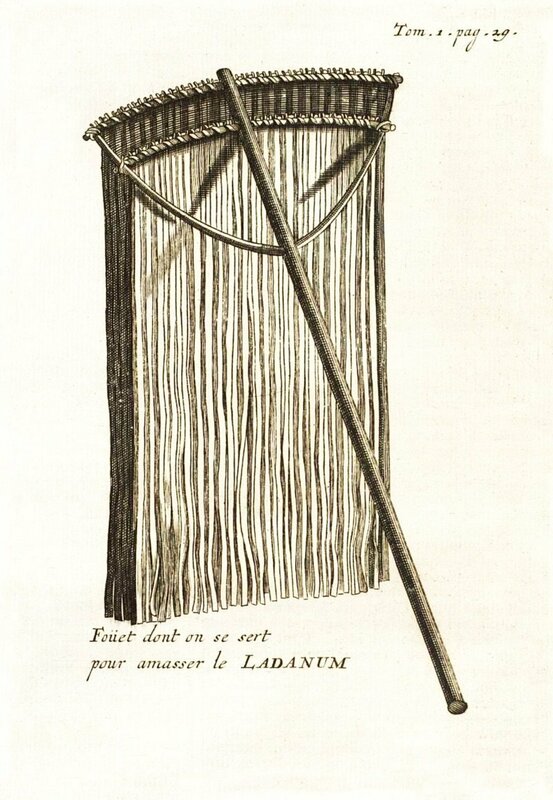 However, we have found that for the really deep work, labdanum is much more effective and powerful. Also, as we have mentioned before, for the work we propose, the aromatic substances have to be alive. Our labdanum is an absolute, which means it’s extracted with an organic solvent. 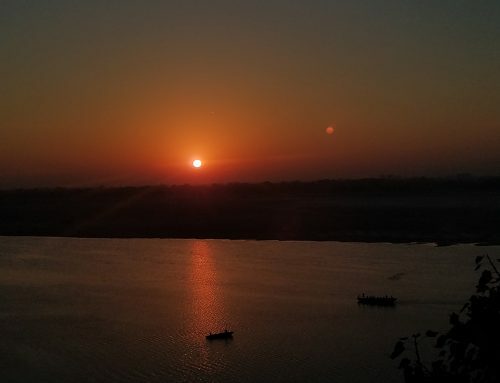 Nevertheless, our labdanum has the aliveness, the viriditas, that we seek. The absolute is thick and viscous, which can make it difficult to pour from the bottle. You can still smell it straight from the bottle and if you hold it close in your hands for a few minutes, perhaps while centering yourself and setting an intention for your encounter with it and smelling it, it becomes less viscous and can be poured more easily, so you could put a drop on a scent strip or into a blend. Enjoy your Aromatic Allies and Your Healing Journey of Individuation! (2) Reference from Jah Skipper’s monographs – (Jepson Herbarium, 2018). (3) Reference from Jah Skipper’s monographs – (Jepson Herbarium, 2018).